General Dynamics Ordnance and Tactical Systems – Canada (GD-OTS – Canada) is one of the world’s leading suppliers of large-calibre tank ammunition. 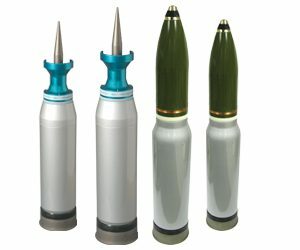 The company’s globally acclaimed 120mm tank ammunition combines tremendous firepower with technological advancements to provide unsurpassed combat effectiveness. The IM HE-T round provides Leopard 2 tank crew with an enhanced capability against infantry. Its HE payload is over twice that of in-service HEAT round and moreover, its IM properties provide the crew better protection against most current threats. A two-mode hand-settable fuze allows functioning in impact or delay for maximum fragmentation/blast. The IM-HE T also has a trainer ballistically matched to the tactical round. The M865 allows for a realistic training of tank crew through its form and fit match to the Kinetic Energy round currently in-service with the Canadian Army. The M865 uses a cone stabilizer to limit its range safety template to less than 8 km while providing similar accuracy and time-of-flight of the tactical round.